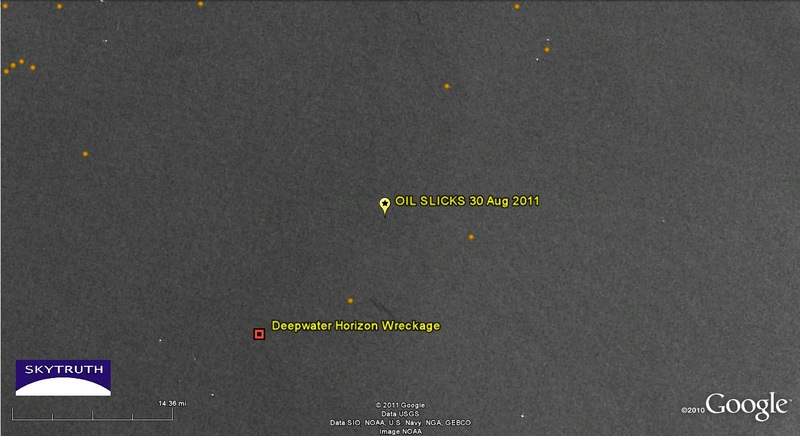 We are focusing particularly hard on the area of the BP / Deepwater Horizon oil spill in recent days, after documentation of slicks in the area near the Macondo well site on August 19, and about 15 miles to the northeast on August 30. 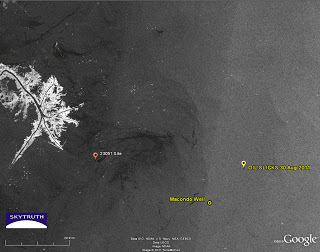 The small area of thin slick sampled by Ben Raines on August 23, about one mile from the well site, was chemically tested by Ed Overton of Lousiana State University who declared it a “dead ringer” for Macondo crude oil; possibly leaking from the wrecked Deepwater Horizon rig or the 5,000′ of collapsed riser pipe on the seafloor around the Macondo well. 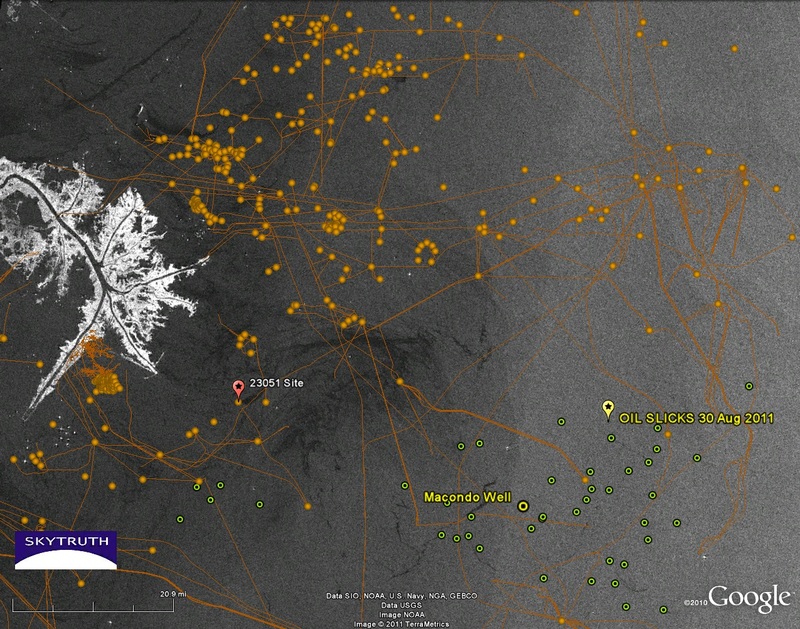 As far as we know, no samples were collected from the much more extensive patch of slicks observed on August 30. Tropical Storm Lee blew in and knocked everyone out of the Gulf soon thereafter. Some have suggested that crude oil from the reservoir 8,000′ below the seafloor might be working its way up through faults and fractures in the bedrock, or along the Macondo wellbore. If that happens we would expect to see “seepage on steroids” as oil works its way to the seafloor along multiple pathways and floats up to the ocean surface to form persistent oil slicks. We would be able to observe those slicks on satellite imagery, just like we repeatedly observe slicks from active natural oil seeps throughout much of the Gulf. Radar imagery is the go-to tool for the job. 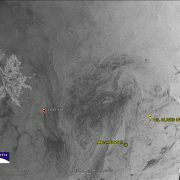 A radar image taken on August 30 showed a patch of slick matching the area and description given by Bonny Schumaker when she flew over that site earlier in the day; an image taken a few days earlier, on August 26, showed nothing interesting in the vicinity. 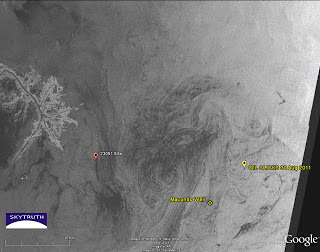 Envisat ASAR image taken September 11, 2011. Eastern edge of the image appears at right (black fill denotes no image data). Mississippi Delta is bright “bird’s foot” at left center. Image courtesy European Space Agency. Envisat ASAR image taken September 14, 2011. Mississippi Delta is bright “bird’s foot” at left center. Image courtesy European Space Agency. 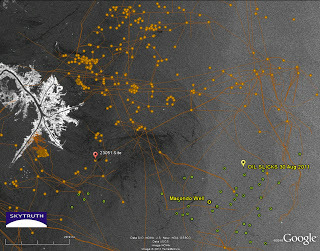 Envisat ASAR image taken September 14, 2011, with oil and gas infrastructure (orange) and known natural seep locations (green). Image courtesy European Space Agency. The upshot: we’re not yet seeing a trend that would support the idea that oil is working its way up from the Macondo reservoir and turbocharging the existing natural seeps in the area, or forming new sites of chronic leakage. But we don’t have enough imagery yet to say for certain it isn’t happening. All we can do is keep looking, and compare what we’re seeing now with images of this area from before the BP / Deepwater Horizon spill began last April. We’re working now on getting those historical images so we can establish that pre-spill baseline.